Unommonday – The Fightin’ Whities! Since sports mascots are on the public mind once again, I thought it might be a good time to post my all-time favorite team. Mind you, I don’t follow sports. When people talk about sports, to me it sounds a lot like the adults in a Peanuts cartoon. When a game is on the tube, I just see a blue screen. And I must say that I have never seen these guys play, nor do I know anything about their record. 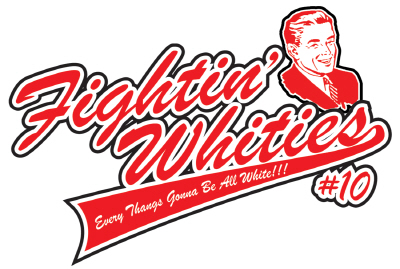 I just know the name of the mascot for an intramural basketball team at the University of Northern Colorado: It’s ‘The Fightin’ Whites’, or the ‘fightin’ whities’ as they were more popularly known. Their motto was “Every thang’s gonna be all white.” And just in case the ironic tone isn’t clear, let me point out that the school used sales of team merchandise to fund an excellent scholarship program for Native American Students.